Bundle includes two EdisonBright CR123A batteries. The market is full of flashlights in a variety of sizes and shapes so when a new one comes along, the first thought to cross your mind would probably be, why this one? The initial thing you will realize is the feature-rich capabilities that come with a flashlight, especially when you think about the size of it. Weighing in at less than 2 ounces (1.6) without the battery, this 3.5” device may not receive any respect at first. On the other hand, the 510 lumen bright output is as mighty as it gets for something this small. In addition to power and compatibility, the Felix offers three selection choices, which include standard lighting (four levels) a strobe option and an SOS mode to call for help. Most people think of flashlights as a tool to be used when the lights go out at their home. These devices can be lifesavers as the user maneuvers through the dark hallways in an attempt to find the fuse box or candles for an extended blackout. Specialty flashlights such as the Fenix PD22 UE can be implemented for other purposes. ● The size and power of this device give the user the advantage of carrying it on their person or purse for instances when an attack is imminent. ● The brightness will give the user an advantage to ward off any unwanted muggers, giving them a few minutes to escape from harm’s way. Even if you are less than impressed with the size of the Fenix PD22 UE, it would be impossible not to take advantage of the tail switch which provides the user with quick lighting access to an otherwise dark environment. Many users have lost the ability to engage their flashlight due to inclement weather, which included water. This remarkable flashlight has a certain level of water resistance, which include a 2 meter depth which has been tested for up to 30 minutes. This simply means that when other flashlights struggle during hurricanes or being dropped in the toilet, the Fenix will continue to shine on brightly without missing a beat. I wrote an article of 8 easy steps to choosing the best led flashlight here, if want to see the checklist. 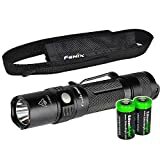 Many users would be less than interested in knowing the specifications attached to a flashlight, other than the size of the batteries that it takes. One detail that should be of specific interest to the user is the fact that they should be able to use the flashlight for about 50,000 hours without having to change the LED. ● The Fenix can operate on one 3V 16340 rechargeable Li-ion battery, or a standard 3V CR123 battery if you prefer. ● Batteries won’t come with the device but are available for purchase with the device when the user decides which one will serve their purpose. ● An intelligent memory circuit immediately recognizes the battery being used and makes the necessary adjustments for it. It’s a definite evolutionary step forward from the previous Fenix lights I’ve owned. With the short CR123A battery, this is about as short a one-cell endcap switch light as they can make – it’s notably shorter than the Fenix L1D one AA cell tailcap light that I was EDCing. The PD22UE also has a pocket clip installed, which is just a solidly good thing: it’s well made and will protect the thing from loss. And the CREE XP-L LED throws a heck of a lot of light – way more than the last light I was wallet-pocket-carrying. Turbo mode is 400 lumens with the disposable battery I’m carrying, and 510 with a rechargeable one. There are four different light level settings as well as a strobe and SOS mode, which are controlled by a side switch. The thing is waterproof to 6 feet or so, comes with a lanyard, sheath and diffuser, and is just a quality piece of kit. As I’ve always done, I carry the light ready to activate with maximum light blast (on the theory that if I need light, I need LIGHT _now_, and I can always turn it down if I don’t need so much). I’m coming to find that the side switch to change light levels is not at all easy to find by feel when I’m wearing neoprene patrol gloves. Heck, it’s not that easy to feel when I’m _not_ wearing gloves. I’ve been working on rolling the head of the thing between my thumb and forefinger while applying pressure – my hope is that I’ll stumble onto a technique that enables me to trigger the side switch without looking for it. There are very few areas in the Fenix PD22 that may be considered as cons like the strength of the clip, however, when you compare the pros to purchasing this flashlight, it seems pointless to look anywhere else. Flashlights are meant to shine the way for all to see, and the Fenix does exactly that with a 426-foot beam distance. ● There are different levels of brightness (total of 4) and the user would probably feel comfortable using this device in any circumstance. ● An AOD-S diffuser makes it convenient for the Fenix to stand on almost any surface or work area you need and the solid exterior protects the device from most falls. Like many users shopping for a flashlight, I prefer to spend a few dollars more on a device that I can rely on and judging from the features being offered here, the Fenix PD22 Ultimate Edition is the smartest choice as far as flashlights go. In my opinion, size, strength and durability are key factors in any purchase, and this device has it all. Coupled with the fact that I can carry it with me wherever I go and even use it as a form of self-defense, I probably wouldn’t buy anything else. Even after weighing in on all the other benefits of the Fenix, the feature that clearly tops the list is the water-resistant capabilities, I may never need to use it, but it is good to know that it is there.